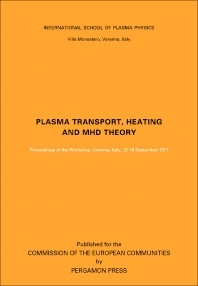 Plasma Transport, Heating and MHD Theory provides information pertinent to the theory of plasma transport, heating, and MHD. This book describes the resistive steady states of elliptical cross-section plasmas. Organized into five parts encompassing 28 chapters, this book begins with an overview of the effects due to instabilities excited in the low-density regime of tokamaks by runaway electrons via the cyclotron resonance. This text then examines the formulation of transport theory, which is applied to transport in tokamak due to trapped-particle instabilities in the quasi-linear stage. Other chapters consider the stability of the boundary regions of gas insulated plasmas. This book discusses as well the zero-dimensional or point model of the Elmo Bumpy Torus (EBT) experiment in which spatial dependences are eliminated by replacing all plasma gradients by characteristic scale lengths equal to the plasma minor radius. The final chapter deals with anomalous transport theory. This book is a valuable resource for plasma physicists.